​Your browser might be caching an older version of the site's style information, which originally wasn't able to accommodate longer navigation titles. If that's the case, refresh the page with Ctrl+F5. If that doesn't work, go to History and click "Clear history", and choose "Everything" for the time range. Then click "Details" and choose only the cache. Refreshing the page did it. ​Known issue. Should hopefully get corrected later today. 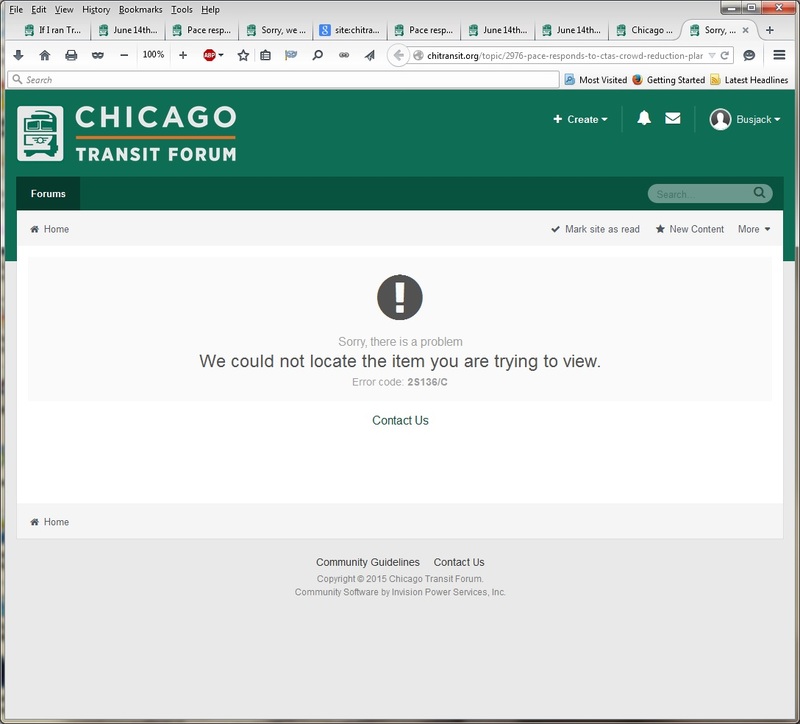 Due to an unexpected issue with a recent software upgrade, attachments posted prior to the Chicago Transit Forum transition are currently not available. This issue is being investigated. ​Sounds like the Lollipop issue with Samsung phones.... my advice if you have a Galaxy S5, Note Series phone, or any Samsung Smartphone currently running KitKat(4.4.4), Don't Upgrade if your phone says one is ready for install. Rant aside and apologies for being OT, you and your team are doing a great job, Kevin. Is there any way I can do an advanced search of the forum topics and posts? For example I was trying to search for posts by me to see if I was repeating information, but the closest thing I got was the drop down menu next to the search bar, which had a "User" selection. Will that do what I want? Update: The search bar changed, and now there's an "Advanced Search" option. ​Also, if that isn't good enough, you can do a Google search with site:chitransit.org + [search terms]. But this search is much better than the old one. ​Thanks! I also had a go with this site's search, and it worked quite well. I was thinking, after referring someone back to a chicagobus.org gallery, shouldn't there be a button on the chitransit site banners for chicagobus.org? Is just my computer or ChicagoBus.org just got took over a by a different website selling faked ID on Chicago Transit Forum? Occasionally when accessing the forums via bookmark/favorites bar, the little area where I can click to access my profile is missing like I'm logged out, and the sign in button is there. In fact, the site also allows me to log back in without a hitch. However the member list says I'm an active user, and if I click on a forum category, I'm logged back in and the Sign In button is back to being my profile link. ​I've recently been occasionally seeing this as well. I'll see what I can find out. As a general update, the developers are working on some improvements to the post editor to improve performance (particularly on mobile) and improve the quoting engine. Timeframe is a few weeks. ​I just had something similar. I save the cookie for chitransit, but when first accessing it had me as not logged in. Instead of logging in, I just closed and reopened the browser, and it recognized me. Also, I hope the developers are paying you to debug their software. Update: Just happened again, but hitting refresh was sufficient. I just had something similar. I save the cookie for chitransit, but when first accessing it had me as not logged in. Instead of logging in, I just closed and reopened the browser, and it recognized me. Their support team does all the heavy lifting. Just installed some updates. It may or may not fix the logged in issue. Let me know if it still happens. However, when I just pasted the link into the message, I got the linked post. But strangely, when I just paste the link here, I get the post embedded. Anyway, the post to which I am referring is the last one I posted in the "If I ran transit" topic, which is http://chitransit.org/topic/3440-if-i-ran-transit-for-one-day/?do=findComment&comment=76388http://chitransit.org/topic/3440-if-i-ran-transit-for-one-day/?do=findComment&comment=76388 and the link tool quit working in this post. Update: Try link tool once more. Tool now accepts the url, but doesn't direct properly. The problem I mentioned above with the link tool is still happening, especially with links to other chitransit.org posts. At the moment, I used a browser addin that created a tinyurl to try to work around it. Also, as sw noted, the changeover seems to have obliterated embedded links made before the forum software was upgraded. Thanks, I'll have the support team look into these. Please let me know if you're still experiencing the issue with the link tool. Support is investigating the attachment problem. By using the term "embedded," I might have misled you that it was an attachment problem, while the real problem was that somehow links lost their urls. For instance, if you look at this post, the "auction site" link is to the same topic, not to wherever the government surplus auction was. But at least the link "this post" worked this time. Thanks. Are you aware of any other instances where this has occurred? I've looked through some other old posts but haven't found any additional occurrences. It was mostly a matter of my having remembered it coming up, and looking at topics with a long enough ago start date and finding that one. I'm not having too much luck, except that the links in this topic seem to all have been converted to the topic, instead of whatever were the separate references for Adelman's and Sims, for instance. Issues regarding legacy attachment links have been resolved. The links I cited above weren't.